Thanks for the layout. Are you sure about the transistors? In the Green Ringer Q1 and Q3 are NPN and only Q2 is PNP... Also on FSB Q1 and Q3 are marked as 2N5089 (NPN). Output cap is 100n on schem too. no just typos. i made the corrections. Which transistor is Q2? Thanks. I think he means which one on the layout is Q2. They're not labeled as to which one is which. Are they 1-3 left to right positionally? Also, in the notes it says Q1 & Q2: 2N5089. Next line says Q2: 2N3906. Is the first line supposed to be Q1 & Q3? Wtf, the transistor labels disappears from the board, and I see the notes as it should "Q1&Q3: 2N5089", "Q2: 2N3906". Not sure why it's not coming up right otherwise. I'll go back and put the labels in when I get home in a few hours. Thanks for pointing that out so I can put it back. In any event Q2 is the transistor in the middle of the board. Verified. Used MPSA18's instead of the 2N5089's and works fine. Placed after a NKT275 loaded Fuzz Face. Sitarish on the bridge pickup and metallic chaos on the neck. Thanks Zach for a great layout. Oh and I had to replace the 100uf cap with a 47uf and the diode to ground with a BAT 41 for empty stock reasons but I figured it was a filter cap and a polarity protection diode so wasn't that imperative? If I'm wrong let us know but it sounds really cool at low volumes, i'll crank her up tomorrow. great job man. when you get some 1N4001 i would swap out the BAT41 for the power filtering. also, glad to hear it worked with MPSA18s, i would have thought that they would have way too much gain compared to 2N5089s, 10000s vs 100s respectively. also, i went back to my layout and removed the notes and transistor labels to redo them, so they should show up on the layout. if not let me know. Thanks for the answer. I'll built this soon. Hey Zach, I used the MPSA18s as I was under the impression that the 2N5089 was a higher gain device? I've socketed the trannies though so i'll pop some others in today. Thanks for the heads up re. the diode, yeah 9v > Gnd, makes sense now it's function is for power filtering. Looking forward to stacking it with some distortions. On a side note you could save a column by sharing the same hole for the 2 68k like we usually do with links and moving the link 1 column right. Hey already: Yea I saw that. You could also have the diodes share a hole, and save another column. I didn't do that on the layout cause I try to avoid components sharing holes and standing resistors, but I could tweak the layout later with those changes for those that was a smaller layout for a 1590a. Hey Phill. Both 2N5089 and MPSS18 are high gain/low noise, but MPSA18 typically have higher gain. Not saying it won't work, just saying it may sound or act different with 2N5089, know what I mean? Glad your enjoying the build too man. Hey Zach I tried some lower gain trannies and they seemed to work better (sounds less compressed now). Ended up with BC107 for now till my 5099's arrive. BTW I did a little P Diddy name change [P.Gofton > Phil.G]. Bit friendlier to be on first name terms I reckon. Sweet, great info phill. Really glad to hear that it sounds even better now. I accidentally broke with 1n4001 diode when solving for issues and hooked it up with a bat 41. Is there a specific reason as why to not use a bat 41? I'm out of 1N4001 as well for the time being is there anything that's comparable to them? Or should I just wait and re-up my stock? Do the 47nf caps need doubling to use this for bass? I don't think so. I've seen a few videos on YouTube with this used for bass as is. Cool. Might have a stab at this then. Can somebody point me to the differences between this beauty and the green ringer? I'm having a hard time finding them. Has anyone tried using a 5088 instead of 5089? Yeah man they work although i tried 2 BC107's and they seem to work better for me. Still waiting for some 5089's. I found the 5088's way to low gain and the 5089's a little better. Tried an mspa18 and a little better still but not right atall. noob question - what is CLR? CLR, means current limiting resistor. So instead of having to wire the +leg of the LED with a resistor to directly to the do jack, you connect it to the main board. The CLR prevents the LED from blowing up on you. This will be my first build... can someone explain the difference between the orange/pink/yellow caps? Is there a key somewhere? The pink is electrolytic, normally available in the uf range. The orange is film or poly. Normally in the nf range. Yellow is ceramic. Available in the pf to nf range but used for pf because film caps don't go that low. But you can use the ceramics for the nf's also instead of film. Hey man, welcome. If this is your first build I would highly suggest reading the build guide before doing anything. Just to add to what Brent had already mention. Typically you want to use ceramic caps for pF values unless you need some thigh to fit in a tight space, as they can be microphonic. Also, don't get hangup in the colors of the components, pay attention to the values as you'll see different colors for every component, so if you look at the value you know what you should use. Hey thanks for the reply. I've constructed the pedal, and the pass-thru works, and the effect kind of works but the effect is competing with a loud hum. I don't quite know what the problem is, I'll restart a new one tomorrow. Hey Robert, I know I'm months late but I was wondering : did you find what was wrong with your first build ? I'm experiencing the same problem as yours : the effect works but with a loud hum. I've now just finished my second build and it's the same problem. Maybe something wrong with one of the transistors ? Mpsa18 the best so far but this is still a volume and gain sucker. Something isnt right and i have built 2 of these. Are you sure the values are right because it feels there is something wrong. Based on the trace I'm certain the values are correct. I honestly think you've got build errors in both of your builds. It was verified with MPSA18 which are very high gain, as well as with BC107 which is much lower gain, 100-500hfe. Hey I know this is from two years ago, but I'm having similar problems to what you're describing, volume is low and I have an everpresent hum going on. Did you ever get it figured out? Look at the tab labeled offboard. No worries man, I'm glad to help. Keep in mind you're not really going to see how to wire the switch for any of the effects here unless it's special, like the KLON. The reason being that the true bypass offboard wiring is all the same, so keep that layout handy. Quick question. Ive been on the fsb and checked the trace, and appears on yours theres a third diode. The two 4148's are there but on this one the 4001 is added. It's there. Check the notes on its position, it runs from the 100r resistor to ground, it looks like a white circle. I have to go back and mark it as D3. I have found my issue. I forgot the jumper. Working fine now, both 5088 and 5089 tested id say not much between em. Maybe wise words repeated but i slept and relooked with fresh eyes, i was about to have a crack at some green ringers but sonically through research i prefered the tentacle. There my be not much difference if tall. Great man. I figured something had to be off in your build. I always do that when a board is giving me grief when it should work and doesn't. Just walk away for a bit and I can usually spot the problem in 5min. How much signal does this thing need to sound right? I've built one (matched pair of 2n5089s) and I just get a quiet, tinny sound out of it. I'm sending my Jazz bass straight into it, but I've also tried putting a boost in front of it and it's still the same. I think you've got a build error or two. Post pics over in the debugging section of the forum. I was reusing a 22kΩ from another project and it hadn't quite gone through the board properly. All sorted now thanks. Great sounding pedal Zach, thanks for this one. anytime man. it's usually stupid stuff like that we always miss when there's a problem with a build. like putting the transistors in backwards. but, the important thing is it's sorted. how is it on bass? been debating if i'm going to build it myself. Tried this with a Split n' Blend today and it sounds amazing on bass. I'm probably only blending about 20% clean to 80% octaved to put a touch more low end back in, but it makes a HUGE difference. Is it just me or is Q2 upside down? If i compare it to the green ringer it seems to be. nope the pinout and orientation of the transistors are correct. both layouts are different, and the orientation of the transistor will be dependent on where the power and ground rails are. if you look correctly the green ringer's Q2 collector goes to the 10k then to ground, the tentacle's collector goes to 10k then the power rail. just found that odd, i Wonder how much it changes the sound. There are 2 10k resistors that come off Q2, 1 is 10k to ground off the emitter, the other 10k to power off the collector. This is the same in both the green ringer and tentical. Again, this has the same topography as the green ringer with some different values. I would not sit and compare the arrangement of components between the two layouts to see differences as where the components are placed are not going to make a difference the values will make a difference. If you're insistent to find all the differences between the two just compare the schematics. As to how the differences in component values affect the tone you'll have to either build the two to compare for yourself or check out some audio/video clips. No the q2 transistor is clearly not hook up the same. In the green ringer the Emitter goes 10k to the positive rail and collector goes 10k to ground. Im not talking about the components values at all. BTW they are almost identical apart from q2 orientation. Q2 is backwards according to the schematic for the Tentacle and Green Ringer (which makes perfect sense since it is PNP), but all you need to do to match the schematic is to swap the collector and emitter around on Q2. 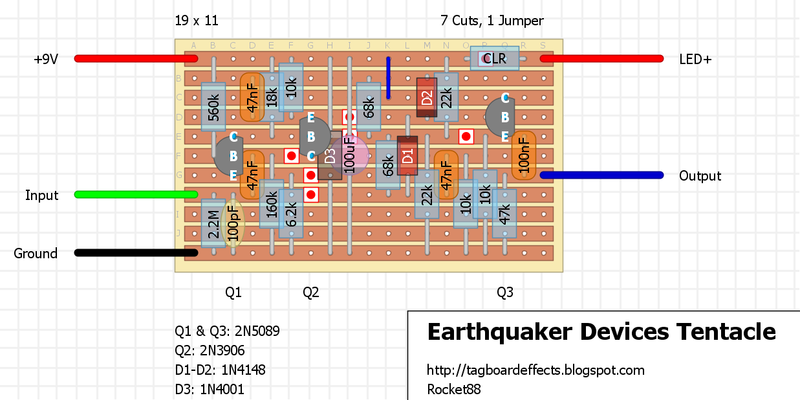 Took a look at the schematic again, and yes Q2 was reversed. The layout had been updated. Surprised it was verified with it reversed, which is why I didn't go back to look at the schematic, my bad. 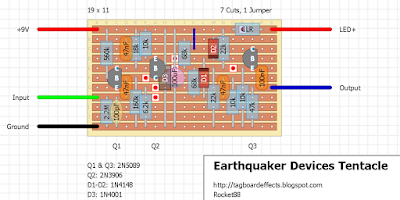 But again, comparing layouts of similar pedals will not help figure out mistakes, since the layouts themselves will be different you need to look at the schematic. I put a note at the top for those that have built this based on the original posted layout to just flip Q2. This is interesting, I'll flip Q2 tomorrow morning and report back. Now it's working properly! I knew it wasn't 100% but the trouble with not ever playing or hearing one and solely relying on YT vids is you assume it could be your own gear (guitar/amp) that's effecting the sound of the pedal but voila now i'm getting that 'klang' and cut through at lower boost levels. Thanks to Greg for giving us the heads up, cheers pal. No problem.... I was wondering why I though it could have been a reversed beta deal like what death by audio uses in alot of there pedals. Glad it's cleared up. I was starting to wonder if I was crazy! Hey Zach, I put 2N5089's (Fairchild) and the 1N4001 in and all is well. Really well actually. It's been fun experimenting...it's extremely responsive to where in the chain you place it/what you feed it into etc so i'd advise anyone to mix and match up with boosts, dirts and fuzzes to bring out the different flavours. Current setup favourite...Tele Custom > germanium fuzzrite (dimed) > tentacle > catalinbread echorec. Thanks again man. I put this together and it sounds great! Added the Mini JFET Blend and ran that into an EHX LPB1 and it definitely gives this a bit more versatility. Can't wait to box it up and pair it with some distortion/fuzz! Just got a new hakko fx888 soldering station in the mail today and decided to pop its cherry on this build. This things sounds wicked with my both my bazz fuss and big muff clone. It's awesome , easy to build and I like it pretty much. Just hooked this up today and I'm getting a very gated sound. Is it possible any of the transistors need to be biased? Hi Ian, presuming all your components are correct, this will gate slightly when used. ( You can hear it in the video as well) My advice is to stick with it and you will find what works with this pedal in no time. Of course this pedal may not be for everyone but i like it for that dirty 70,s rock style. Thanks for the reply! That's good to know. I wasn't expecting a perfectly clear sound, but it did seem like the sound in the video was a lot clearer and less gated than my version. I'll box it up and play around with combining it with some dirt pedals. Hello! built this effect and it worked right away. The thing is , the effect is not very pronounced. i used the neck pick up etc, but you can barely hear the octave up, nothing like the demos. I used different values in some resistors, could this be the problem? Hey, help me someone please, where the pot goes since there are no volume lines? Also I didn't catch this thing about CLR, is there any specific model of that stuff? This circuit doesn't have any pots. Built and boxed it yesterday. Only did a quick test at low volume and with little drive. Going to give it a try with fuzz tonight. Noob question, Which is the positive side of the electrolytic capacitor? Non-marked one. The marked side is negative, as in actual cap. yes but, in the layout does not see the orientation. I'm just getting a clean sound, no effect. Troubleshooting: Measured Transistors and Resistors, used sound probe. *R3 is supposed to be 160k, but when it's on the board it's only measuring @ 125 (replaced with a new resistor that I measured at 160k off, reading 125k once it was on the board). Not sure what to do next. The resistors that don't have audio on one leg all measure out ok, so I'm not sure why they wouldn't at least have some passing through. Admittedly I don't really know much at all about electronics so I hope what I'm telling you is helpful. That was the issue thanks - so embarrassing I swear I checked about a million times. The 100uF capacitor, I have a electrolytic capacitor of the same value but it's polarized. Will this still work? and it wouldn't matter which direction? just finished this. it was my first pedal project and it works like a dream. ive already made myself a ts808 too! i think its safe to say im obsessed now!! Is there a way to add a pot to this? A blend would be pretty cool. Tried to put this on a Breadboard, from the schematic and perfboard combined info, but I'm not getting any signal through, just a bunch of crackling when I press and jiggle the components. Since it's my very first build, I'm a little stuck on troubleshooting a thing like this..
-Used 2x BC549C instead of 2N5089, but should be similar enough (according to the collective wisdom of the internet), apart from the pinout, which is swapped (so EBC->CBE, flat facing you). -I probed the thing for continuity and voltages, but I'm not sure what to look for here?? Voltages seem to drop like they should across resistors and D1/D2. D3 shouldn't pass any, right? -I plugged my input jack in, grounded my output jack, then probed the bits of the circuit with the hot output jack, but only at the Input jack itself I get a clear sound; everywhere after it it's just suuuupersoft or crackling.. I have no clue where I should try to probe, or what I expect to hear? Built the supereasy Bazz Fuzz, works like a charm. Substituted the 3 trannies from the Tentacle, all 3 work nicely, so I know they work, and my pinouts were correct. Plugged back the first BC549C as Q1, and tried to use only the first section of the build (so outpu-hot hooked up to Collector of Q1 (disconnected everything after it), nothing comes through.. I'm quite new at this, but I'd thought that at THAT spot at least something should still come through..
Is it possible my Resistor values are just too far off? Maybeee a silly question, but I've found so images online of the schematic of this veroboard diagram and some of the capacitor values read different. Which image should i go with? I am only this cautious because I'm seeing peoples comments mentioning a problem with fuzz and I dont want to get this wrong. Also is there a difference between metal and carbon resistors? Hi, it is just me, or there are two extra rows at the bottom of the layout? I'm planning to build it for a 1590A enclosure, and every milimeter is gold. I have built it (no enclosure yet, waiting for it) without the two bottom rows, and it is working. Just a little tight for the 100pF Capacitor, had to use a ceramic one, and the circuit sounds amazing! I used NPN transistors with a high beta (>400), I think they will give higher input gain and more output gain in the final stage, can anybody confirm my assumptions? Thanks! Seeing as this effect works better on the low end, I added a bass booster to it (used the EHX Hog's Foot you had. Its the 3rd time a try to build this pedal and well... I does distorsion but not the octave up... any idea? I've used the exact same components, and the connections on the veroboard are okay... wonder if its something about the solder or... I dont know, help! I can tell you that "a friend of mine" built this and found that when it is NOT working, it can still pass a distorted signal. So, it may not be working, but sound like it is. Not that that is particularly helpful, but it may help you troubleshoot if you ignore the fact that it is passing some sort of signal (in other words, don't assume it's working because you hear it). Also, use schottky diodes. It makes it sound even better. Built this and it works like a charm, like the demo's. No noise, very clean octave, most friendly in front of the signal chain. I tested over and over with different NPN transistors: 2N5089, MPSA18, 2N3904, BC550, BC549, BC548 etc between HFE of approx 240ish up 600+. Very hard to notice a difference, very hard. Stuck with BC549's matched at HFE 250ish. Maybe i felt that the signal was slightly fragmented the higher the gain, more consistent at lower gain. So slight that I probably made this up. Either way it rocks. Thanks team. Mine is even a little louder than bypassed signal, so there has to be something wrong with yours. check tracks for bridges and check solderings, usually I have to use a magnifier to see little spots between rows. Thanks for your reply manolonte, i'll definitely do that next :) Did you use exactly the same components as the schematic ? I did, but wondered if the component tolerances were an issue. I might just build another to see if its any different. Thanks again, Ian. Basically I used the same values and components, initially. After that, I did some experiments, but it worked right from the beginning. Well, except the transistors, I used metal encased bc107b because I have many of them and they are cool. But I don't think they are that critical. I built a couple of these with great success, I have used it mostly with muffs so far and it sounds really nice !